Until 1987, the Department of Eastern Art of the Ashmolean had not sought to acquire decorative works of art from Japan of the second half of the nineteenth century and the first decades of the twentieth. These were very much out of fashion in museum circles, though they were by then several serious private collectors both in America and in England. In fact, the British Museum had acquired a pair of Imperial presentation cloisonné vases by Namikawa Sōsuke in the mid-eighties, perhaps as much for their historical interest as for themselves; nevertheless, the British Museum actively bought them. The Victoria and Albert had acquired excellent examples of Meiji art-crafts before the end of the Meiji period, but thereafter collected almost nothing. The Department held a few pieces of the period, some of them extremely fine, and ten of these are included in this catalogue. Several of these are recorded as having been purchased in Japan by Sir Herbert and Lady Ingram on their honeymoon in Japan in 1908; this group is being studied by Joyce Seaman. The art market provided the opportunity for purchase, the leading specialist being Malcolm Fairley then of Sotheby’s, and it was with his encouragement that the first purchase was made, the Andō cloisonné vase [EA1987.12]. As far as we are aware, no other museum in Britain or continental Europe, and possibly none in America or Japan was active in this field until some years later. 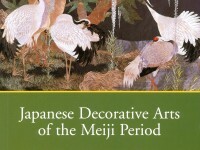 In 1991 the department held one of the first exhibitions of Meiji period decorative art since the period; the inclusion of the Shibayama style pieces was certainly the first museum exhibition of the style anywhere, since the pieces were new. This was the collection of John R. Young, of Texas, and was published by Impey and Fairley as ‘The Dragon King of the Sea’. Collaboration with Fairley over the publication of the great collection of Dr David Khalili gave Impey more exposure to Meiji art, and the collection started to grow by active purchase, made possible by use of the fund left to us by Jeffery Story. Obviously the field is a large one and we have had to specialize; we have acquired examples by certain finer artists, e.g. Namikawa Yasuyuki and Makuzu Kōzan in preference to others, in order to be able to trace the evolution of their styles and hence to extrapolate to the work of other artists. We have tried hard only to acquire works of the finest quality, even with the limited budget available to us, and the viewer will find some minor (or even major) masterpieces. We hope to continue to add to the collection. Regrettably, for reasons of conservation the textiles are rarely on display.